When I published this blog last year, the response was overwhelming, which can only mean that this topic is emotive, and resonates with many of us. It’s also why I was motivated to refresh it to keep the conversation going. Here’s a question – why do you think our world is so unique? Chances are that each of us has a unique answer to this question, and that’s exactly the point. We live in a wonderfully complex and diverse world. Yet, rather than embrace the richness of our diversity, in many societies, we still often lean towards valuing sameness and perpetuating exclusion. And this is true for many organizations as well where the workforce often doesn’t reflect the diversity that’s around us. But, there’ s good news – a noticeable convergence in research findings on diversity and inclusion (“D&I”) at the workplace indicates that it is no longer a ‘compliance program’, and has become central to organizational success. For instance, in 2014 companies in the top quartile for gender diversity in leadership were 15 percent more likely to experience above-average profitability; in 2017 this number rose to 21 percent. I contend that this correlation is not a coincidence, and it’s increasingly apparent that D&I impacts brand, corporate purpose, and performance. However, despite the optimism and intention, the gap with reality is still quite wide. In my view, there remains a big disconnect between what we say, and what we do. Many companies’ efforts are too fragmented, ad hoc, and slow – for example, how often do we see leaders attributing their success or transformation to D&I, not very much I would say! What does all this mean? For starters, let us completely abandon the ‘band-aid’ approach, i.e. the tendency to fix only what appears broken and not worrying about much else. If it’s a transformation we seek, why not go to the heart of the matter by changing the way we work? From the time I initially shared our ambition, we at Schneider Electric have been making progress in changing the way we work to achieve that cultural shift. We believe that “Access to energy is a fundamental human need” – our aspiration is to improve lives by bringing energy, efficiency and sustainability for all, and developing sustainable energy solutions for our customers. This belief extends to our D&I philosophy as well. Our ambition is to offer equal opportunities to everyone everywhere, and we want our employees — no matter who they are, or where in the world they live — to feel uniquely valued, and safe to contribute their best. 2018 was a significant year as we refreshed our People Vision – Employee Value Proposition; Core Values and Leadership Expectations. Embedded now within the EVP is a commitment to inclusion – valuing differences, and the aspiration to become the most diverse, inclusive and equitable company globally. 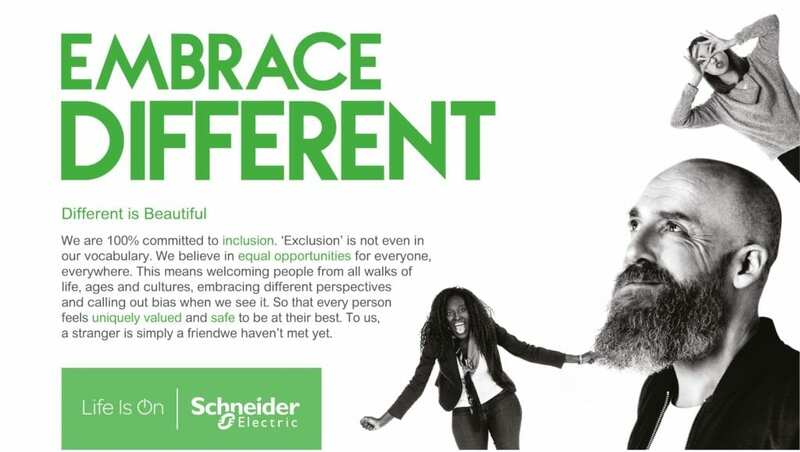 “Embrace Different” is no longer just an idea, it’s one of Schneider Electric’s five core values because we believe ‘different is beautiful’, and the word ‘exclusion is not even in our vocabulary’. To deliver on this ambition, we transitioned from a one-headquarter model to a multi-hub model. Key jobs were then relocated to these hubs to create a global leadership structure. We realized that people are not always mobile, so instead of asking them to relocate, job opportunities were created closer to them. For example, let’s consider someone living in the US or in China, married with school going children – after having worked in the regional operations, they now have the option to take up a global job without having to relocate outside the country with their family. This is significant as it shows how via multi-hub people have equal opportunities for advancing their careers no matter where they are. Additionally, we have been able to create locally empowered teams for customers; and there’s greater diversity in nationalities at Schneider Electric. The external acclaim that this model has received is a great motivator, and we continue to build an equal spread of global jobs across the Americas, EMEA and Asia-Pacific. To ensure that our people reflect the global community in which we operate, we want to have a greater mix of diversities i.e. gender, generation, nationality, LGBT+ and disabilities. But, this doesn’t happen by chance. Take gender diversity as an example, the mix only truly changes when there are least 30% women in teams dominated by men, and vice-versa. 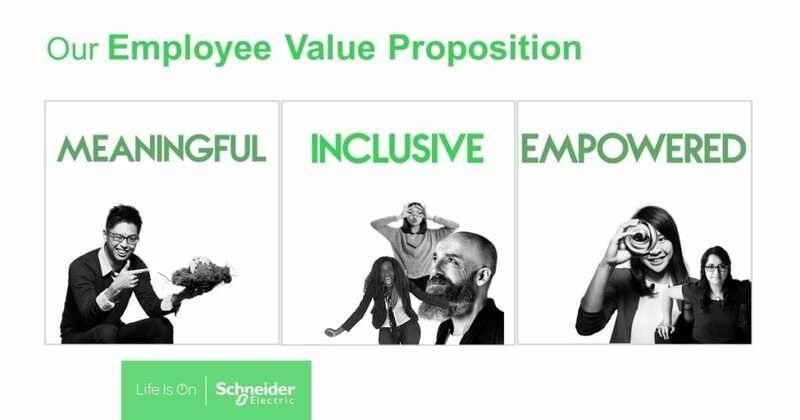 At Schneider Electric, we’ve experienced this in practice by actively promoting greater diversity within executive (27% women) /senior leadership (22% women) teams. In my experience, as the balance begins to improve people start to see a path for their own growth and success – this in turns creates an environment of inclusion characterised by greater engagement, performance, and innovation. Framework to establish workplace gender equity – by the end-2018, 92% of Schneider Electric employees have been covered under pay equity process, and there are regions where actions plans are already complete. I believe that pay equity doesn’t really require a business case, as it’s simply the right thing to do. Flexibility @ work – to make the multi-hub model work, we realised that a complete re-think on the very concept of flexibility would be essential. For us, flexibility is much more than just choosing hours of work, it means a culture of smart working, including workplace flexibility; working time flexibility; and a flexible/ inclusive working environment. Ultimately, it’s about empowering people to make the most of their energy. The global anti-harassment policy to reinforce zero tolerance towards harassment was updated and launched in 2018. Finally, going beyond the policies a commitment has been made within the Schneider Sustainability Impact in these key areas, and we report internally and externally on our progress. By enacting and reinforcing policies like these we hope to establish a true sense of belonging. To lead in a diverse environment, our leaders must embrace different and build the best teams. Behaviours of leaders can drive up to 70 percentage points of difference between the proportion of employees who feel highly included, and those who do not. At Schneider Electric, through active coaching and feedback leaders are expected to build diverse and inclusive teams. In fact, ‘Building the Best Team’ is now one of five leadership expectations based on which they are assessed and promoted. Additionally, through programs like “Hidden bias education” managers at all levels are encouraged to open their minds, and enable a sense of psychological safety for all employees. Schneider Electric is committed to becoming an ‘agent of change’ and building a better world where diversity, inclusion, equity are not mere concepts. As a UN Women HeForShe Corporate IMPACT champion, we have established a D&I Board composed of twelve top leaders. The board is a sounding board for our global strategy, as well as an internal and external D&I champion. We are supporting the work of UN Women in creating ‘Planet 50-50 by 2030’, and the United Nations’ commitment to achieving the Sustainable Development Goals. In 2018, Schneider Electric became a signatory to the UN Free & Equal Standards of Business Conduct for LGBTI equality. Our public commitments and achievements in advancing inclusion have been acknowledged by Bloomberg, Catalyst, and Forbes. I am convinced that global corporations must become visible role models, and advocates of change within society. Diversity for diversity’s sake, and the absence of inclusion can lead to chaos and inefficiency. But, there are huge positives for any organisation that perseveres. In an increasingly complex business environment, finding a way to blend diversity in thought and ideas not only makes an organisation more human, more competitive, and more fun, it might be the only way to achieve sustained business success. At Schneider Electric, we know the journey is long and fraught with challenges, but our commitment is unwavering. Diversity and Inclusion is our marker, our differentiating factor for the future, and that’s why great people make Schneider Electric a great company.